Blended whisky makes up 93 percent of the Scotch market. It's the other 7% -- single malts -- that most wine lovers are interested in. I'll confess that I'm not so interested in blends. Yeah, Chivas Regal and Dewar's are smooth, and the 25-year-old versions of whiskies like these are awesome. However, while I like awesome, I can't afford it: 25-year-olds cost more than $250 a bottle. And "smooth" is not my only goal. If I'm drinking whisky with no "e," I want character. I want to see Sean Connery squint and hear Rent Boy soliloquize. I choose life. I wrote a column last week for Wine Review Online about the role American oak plays in great single malts; I'm not going to repeat that here. Instead, I'm going to pass along a tip: Look for malts that form the base of a famous blended whisky. Each has a slightly different story. Strathisla was my favorite of the three. It's from the oldest continuously operated distillery in Scotland, founded in 1789 when making whisky was still illegal. It's a 12-year-old single malt with a strong flavor of dark chocolate, along with notes of black pepper, orange, seaweed and sea salt. The sea air is strong but I detected no peat. It's excellent, and I like it better than Chivas. But Pernod Ricard, which owns both, makes only 10,000 cases of it a year, as opposed to 4.5 million cases of Chivas. "Strathisla is less than 5 percent of the whole Chivas blend but it's the keynote to the blend," says Alan Greig, director of brand education. "It's heavier, more assertive. But it's a small distillery and we need most of it for Chivas Regal." Fortunately there's enough Strathisla for you to buy it here. While Strathisla predated Chivas, Aberfeldy was built in response to global demand for Dewar's, although not exactly yesterday: the distillery opened in 1898. Because it was purpose-built, it's quite a bit larger than Strathisla, and thus makes up more than 10% of the Dewar's blend. 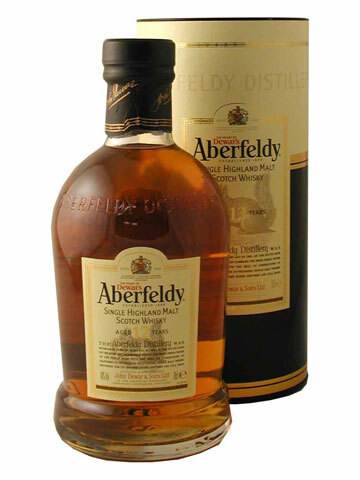 But Aberfeldy single malt is also pretty hard to find because there's a big market for Dewar's, the number-one selling blended Scotch in the US. Aberfeldy has a very honeyed character, with some heather as well. You can smell it and imagine an idealized Scottish countryside in summer, with neither Mel Gibson nor Rent Boy anywhere in the frame. Buy it here. I'd love to tell you what percentage of Johnnie Walker Black comes from Cardhu. But Diageo, the largest producer of single malts in Scotland, wouldn't tell me. 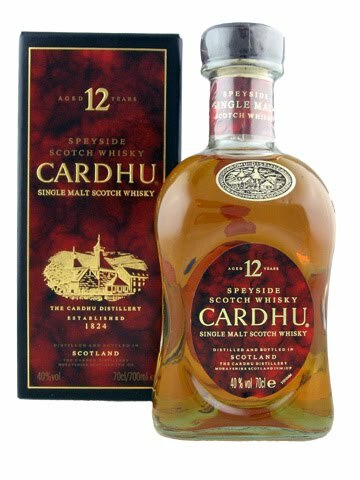 There are more than 40 single malts in JWB, so Cardhu can't make up a huge percentage of it. But I taste it in the blend. It's not hard, because Cardhu has as strong of a pear character as any single-malt I've tried; it could almost be pear brandy. There's also some toasted cereal and black pepper. 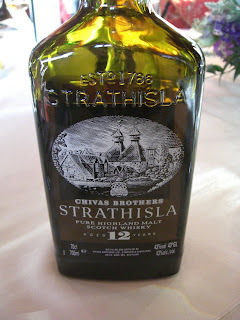 But here are my notes on it, and remember I live in San Francisco and had been drinking Scotch: "So much pear, so fruity and lively -- a slight bit peppery, but not peaty. This is an exuberant whisky, a gay whisky." Yeah, I'll stick with that. Let's face it, the guys who make it wear skirts kilts. Buy it from one of my favorite San Francisco spirits shops. So those are my three tips on cool single malts, with a separate type of tip of the cap to Wine Review Online, which just celebrated its 5th anniversary! I'm going to drink publisher Robert Whitley and editor Michael Franz a toast of a nice gay sophisticated whisky. May ye never want for a friend, or for a dram to give him. Thank you so much for this breakdown. I am now going to amaze my friend who intellectualizes booze with this knowledge...and also since I like JWB a bit myself, then Cardhu is what I must seek. And happy belated birthday WRO!